Kindle version out on 1st November 2016. This is a philosophy book for psychotherapists, organisational consultants and scholars who are interested in the construction of each other, how we make meaning together and move with people in dialogue. John gets beyond a purely cognitive understanding of what it means to be human and shows us different ways of appreciating the nuanced movements in acts of developing relational know-how to create new ways of being - and becoming. "John Shotter is a thinker. Thinking has become quite unusual in academic psychology nowadays, dominated as it is by a narrow empirical perspective, and a distrust of philosophical reflection. This book in required reading for all family therapists who are interested in the dialogical perspective. But be warned… this is far from a manual. It is food for reflection. This book of Shotter's is important, as it urges us to be careful with the language we use. The words we casually speak can keep us captive in our usual, individualistic-rationalistic-mechanistic ways of dealing with things; resulting in a world of fragmentation and separation. It is a rich book, that (not withstanding its urgency) should be savored slowly. Like a good wine." "It is impossible to capture in a few words all the fine detail and nuances of this carefully and beautifully crafted book. The title brings together the key themes of John's work across time, themes that invite and challenge us to go beyond taken-for-granted ways of thinking to engage differently with our social world, our place within it, and our ways of generating knowledge about it. Beginning with a critique of normal science and mainstream psychology - the limitations of rationalization, representation, fragmentation, individualization, mental cognition, etc. - John goes on to offer a social world that is holistic, chiasmic, unbounded, and always becoming. and a way of being in this world as 'participant', in which we create a shared sense of our circumstances and anticipate the consequences of our everyday conversations and actions. Crucially, he argues we need to develop a discursive consciousness, to notice and to pay attention to what our talk with others does and to the potentialities of its movement. By doing so we become open and responsible to ourselves and others. The key ideas we need to focus on are: making a difference that matters and 'humanifying' ourselves as practitioners and researchers." "In this significant book, Shotter further develops his challenge of our dependence on existing theoretical perspectives and their representations. He suggests these orient us to and reinforce the familiar, and blind us to the nuances, uniqueness, and previously unseen or ignored details of our everyday lives and the people in it. Shotter's illuminated challenge draws on his remarkable grasp and interpretation of classic philosophers such as Bakhtin, Merleau-Ponty, Wittgenstein and contemporary critical thinkers such as Barad, Bertau, and Lipari. Speaking, Actually is a fascinating and compelling invitation to pause, step-back, notice, and think: to open ourselves to the emerging practical possibilities for understanding and navigating our relationships and everyday life situations when we can develop a different orientation to them." Harlene Anderson, Ph.D, founding member of the Houston Galveston Institute and Taos Institute, USA. 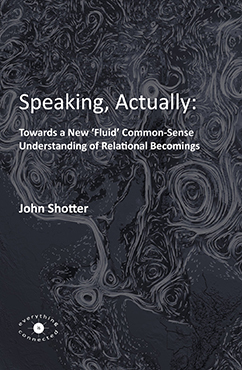 "John Shotter generously shares with us his rich and illuminating conversations with a host of textual friends. Indeed, these conversations - with their flowing forms without formulations, disclosings without closings - exemplify the major thrust of this inspiring work. Life and love are to be found in sensitive, sensual, and unceasing dialogue." Kenneth Gergen, Senior Research Professor of Psychology, Swarthmore College and Taos Institute USA. "Shotter explores the universe of complex "happenings" of daily life. He does not flee from the significance of "fleeting moments" but embraces them in all their complexity. This book is a celebration of the apparently ordinary happenings between us as human beings and in so doing he provides his encyclopaedic knowledge about human communication on why we should refuse to be seduced into thinking that the world of our understandings is predicated on fragmented "after the fact analysis" of fragments of life, For Shotter the particularities of each unique encounter in social relatedness is an opportunity for creative improvisation, for new becoming and new possibilities instead of finding old ways to explain away new happenstances. Shotter is connectionist - a radical critic of a world view that would have us all valorise modernist and neoliberal world views. For practitioners in social sciences including therapists, teachers and social workers Shotter's book will encourage a more profound search for resourcefulness in what "just happens " between us. In becoming spontaneously responsive to the other stops us from being tongue tied to past "after-the-fact" explanations that can mute us to the potential there may be in each unique, "before-the-fact" meeting with another. Take this book read it and ponder on how it influences your ways of meeting in social relations in your life. Shotter's strong and committed voice of dissent towards academic modernist psychology rings throughout the text. Instead of grand claims toward generalised truths, he emphasises the significance of local proximal and familial as the sites of fresh beginnings and new possibilities. In Shotter's eyes we can see optimism in achieving important human connections in the apparently ordinary ways of being and becoming. In this comprehensive text he sets out to challenge the over emphasis in the fields of modernist research that would have us believe that science will provide the necessary answers to complex matters of human livingness." Jim Wilson, Systemic Psychotherapist & past Chair, The Family Institute, Cardiff.